Few in who had drunk too much. £2.59 here for most beers. Purple Moose - Glaslyn Ale 4.20 Just acceptable. £1.99. 2 visits over the weekend. Men without tops walking around the bar. Not welcome. Sharp's - Doom Bar 4.00 Not Tried £3.25 a pint! Up from 3.15 on my last visit 4 years ago. What a rip off. Manager told me its even more in Brighton. So what? Late morning for T. Four times as many people in this, the first JD to open here. Good range on, including upcoming festival ales. Excellent barstaff. Prices much higher than the Maidstone Spoons, but 6 'boring' beers on including Gloombar. Needs a decent anager to overhall to bring it up to a better standard. It's a pretty typical town centre 'Spoons. Pretty soulless, but as Andrew says, its cheap food and cheap beer. Hilden - Molly's Stout 4.20 Not as good as the first time I had it at Tonbridge. More a normal plain stout. We needed some food and that's one of Wetherspoon's strengths in my book - cheap food. Also, their beer festival was still on so there were some interesting beers on offer. Hilden - Molly's Stout 4.20 Dusty tasting beer. Titanic - Iron Curtain 6.00 Sharp slightly milky chocolate powdery sour beer. 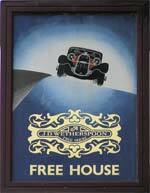 The pub is found in Eastbourne, East Sussex, BN21 4QD. This pub occupies what used to be the Cornfield Motor company building going on the sign painted on the wall above the door. 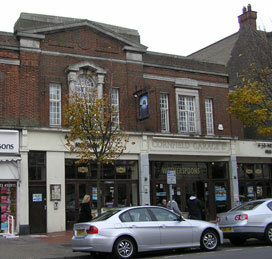 By the mid 19th century, most of Eastbourne was owned by the Cavendishes (Dukes of Devonshire) and the Gilbert family. It was William, second Earl of Burlington, later seventh Duke of Devonshire, who saw Eastbourne's potential. He built the first sea wall and villas to entice wealthy visitors, and had the county surveyor, James Berry, draw up a plan for the town. Extensively expanded, almost doubling its size, in 2015 with an extension on the rear. We have visited this pub 7 times, seen 19 different beers and tried 9 of them.